support this endangered species by joining, or even watching this group! 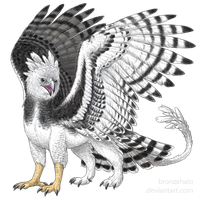 As some of you may know, harpy eagles are an endangered species of eagle and need help. there is no group on d.a for these special birds of prey so please support the largest raptor known today with your art! Its the largest bird of prey with a wingspan of 7 feet and weighing up to 20 pounds. it's wingspan is short compared to it's body, and this is needed to maneuver at over 50 mph across the rainforest skies. it is fast for such a large bird. it's claws are larger than any bird of prey today, reaching eight inches. Harpys' feet can deliver a bone-crushing 7000 pounds per square inch grip that kill's it's prey in seconds. American Harpy Eagle - .•Harpia Harpija•. Great news people! The South American Harpy Eagle has now been taken off the endangered list! though It is still killed for its feathers by the native tribesmen there for ceremonial purposes, there are enough eagles to handle that stress! this is a program that contributed to their comeback, along with many others too. Is this group still active? I've attempted to submit a number of my photos of Harpy Eagles and each one has expired over the past two or so months. I submitted a photo of our Harpies and it expired. Is anyone approving photos any more? Hey, I'm so sorry about that! I've just got back from a rather long college-flavour hiatus, so I'll be able to accept submissions from now on until the other members get back. It's all good. I was just curious as to why my photos weren't being approved any more. I'll try my best to keep on top of it all over the summer (and beyond, if I can!). I am so glad you have taken the time to bring the Harpy to the forefront. Aren't they magnificent?